This lapilli was erupted by Pu`u Pua`i (gushing hill) from the summit of Kilauea Volcano in 1959 and fell to the ground about 800 m downwind. Credit: U.S. Geological Survey. Lapilli are rock fragments between 2 and 64 millimeters (0.08–2.5 inches) in diameter that were ejected from a volcano during an explosive eruption. 'Lapilli' (singular: lapillus) means 'little stones' in Italian. Lapilli may consist of many different types of tephra, including scoria, pumice, and reticulite. 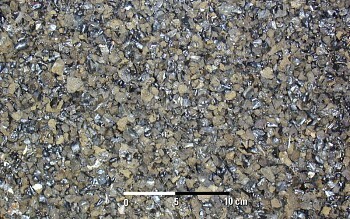 Rounded tephra particles in this size range are called accretionary lapilli if they consist of tiny ash grains stuck together. Ash sometimes form such rounded particles in an eruption column or cloud, owing to moisture or electrostatic forces.